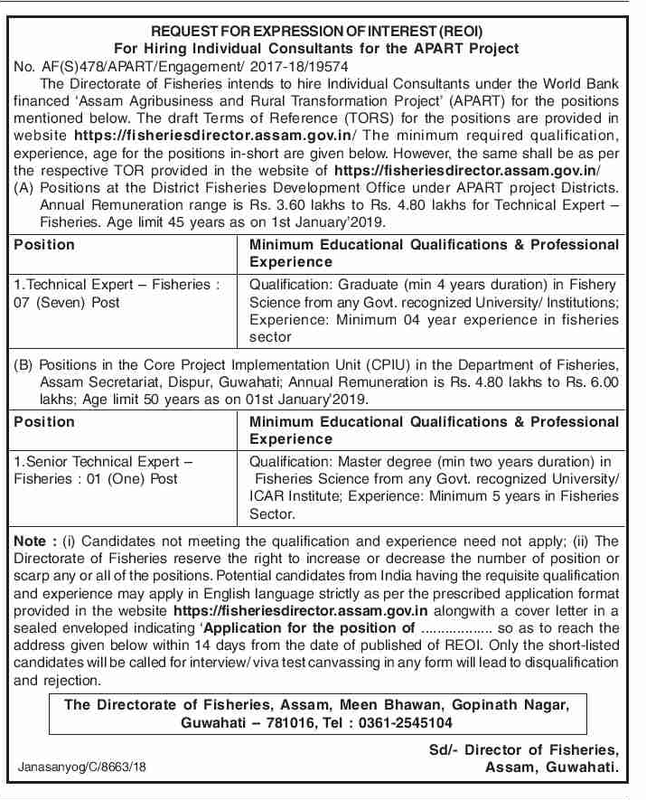 The Directorate of Fisheries intends to hire Individual Consultants under the World Bank financed 'Assam Agribusiness and Rural Transformation Project' (APART) for the positions mentioned below. Educational Qualification: Graduate (min 4 years duration) in Fishery Science from any Govt. recognized University/ Institutions. Experience: Minimum 04 year experience in fisheries sector. Pay: Annual Remuneration range is Rs. 3.60 lakhs to Rs. 4.80 lakhs. Age: 45 years as on 1st January'2019. Educational Qualification: Master degree (min two years duration) in Fisheries Science from any Govt. recognized University/ ICAR Institute. Experience: Minimum 5 years in Fisheries Sector. Age: 50 years as on 01st January'2019. How to apply: Potential candidates from India having the requisite qualification may apply in English language strictly as per the prescribed application format in the website https://fisheriesdirector.assam.gov.in alongwith a cover letter enveloped indicating "Application for the position of______"so as to reach given below within 14 days from the date of published of REOI [09/02/2019]. Address: The Directorate of Fisheries, Assam, Meen Bhawan, Gopinath Nagar, Guwahati — 781016, Tel : 0361-2545104.